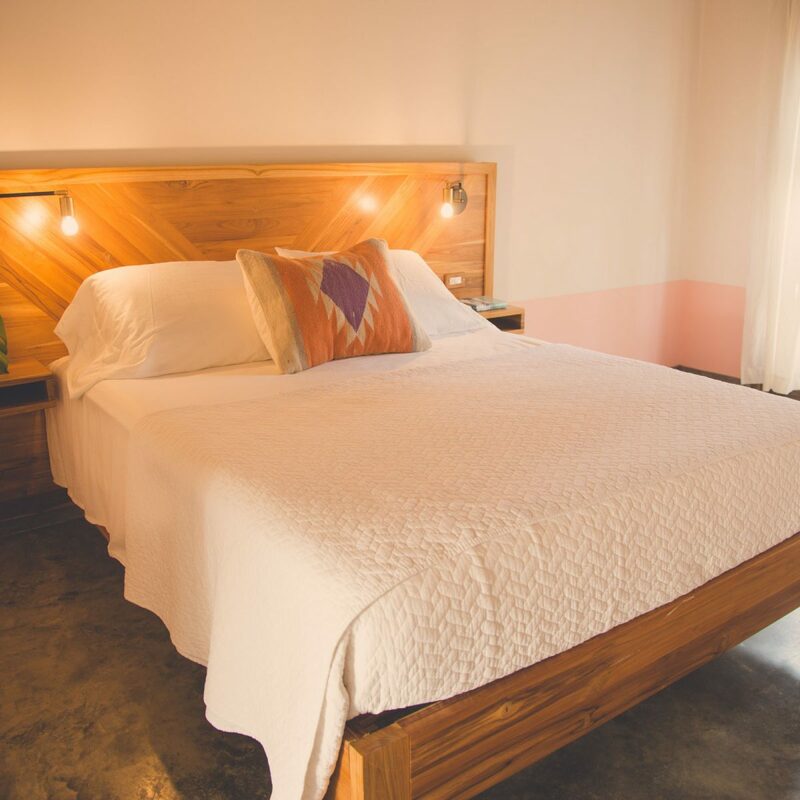 *For the February 22nd – 29th & March 3rd – 10th weeks, our retreats will be held at a different hotel. 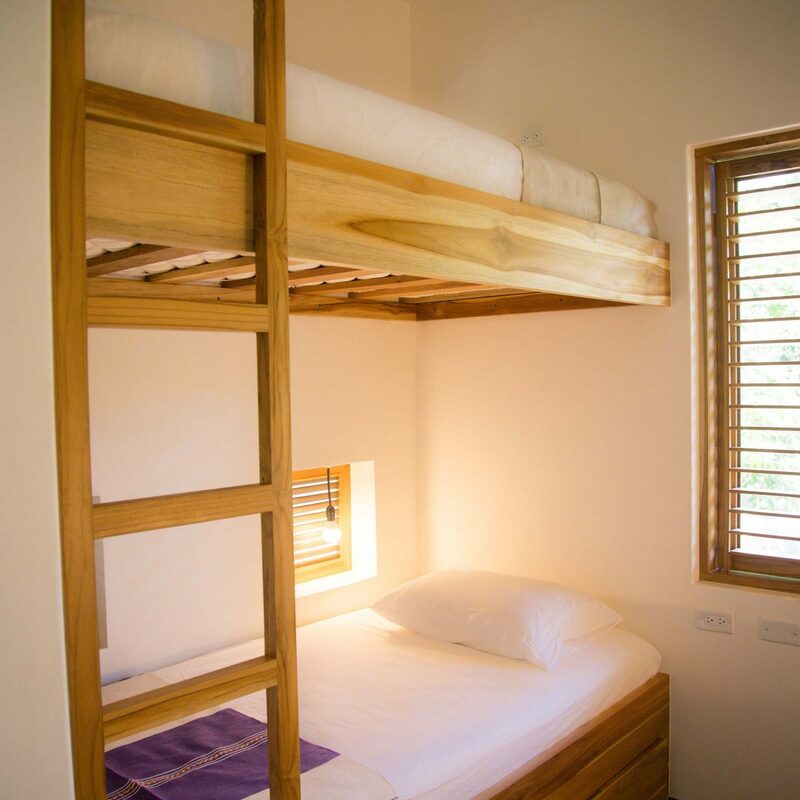 Click here or scroll to the second half of this page to see pictures of accommodation for those trips in particular. 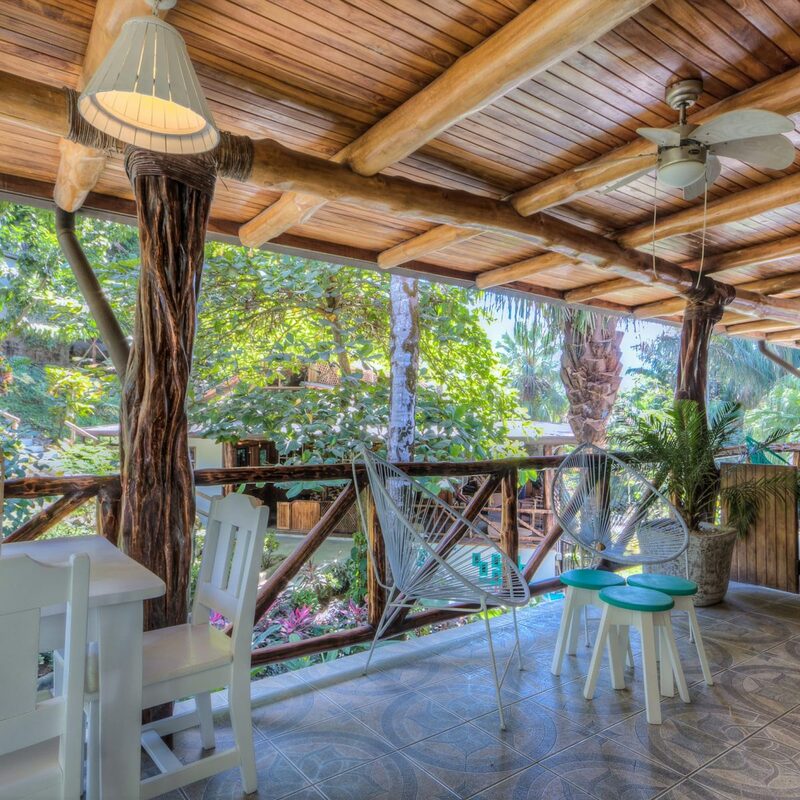 Wake up to a fresh, organic breakfast and enjoy a delicious cup of coffee from your private terrace. 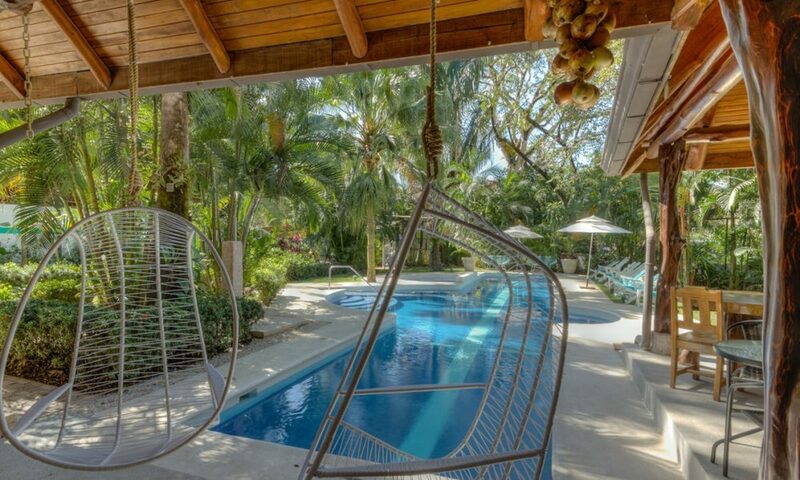 Dive for a swim in the beautiful salt water pool. 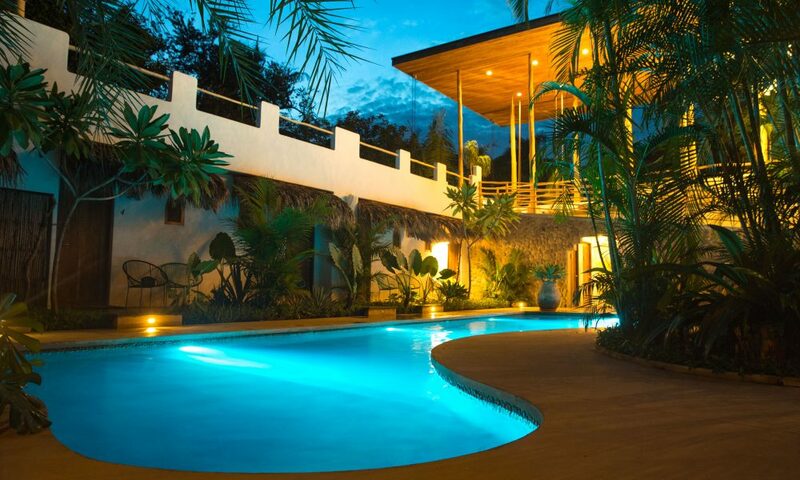 Observe monkeys and birds in the tropical garden that surrounds your exclusive bungalow. 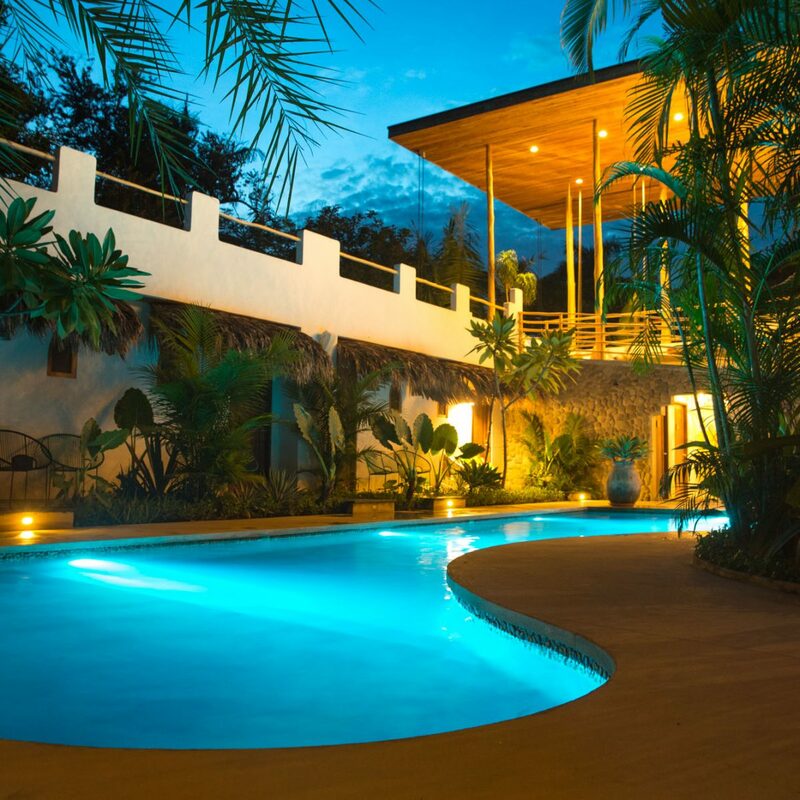 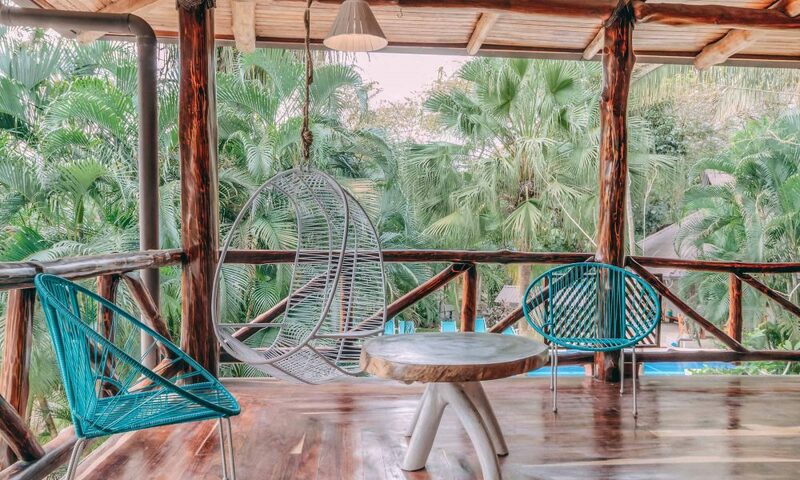 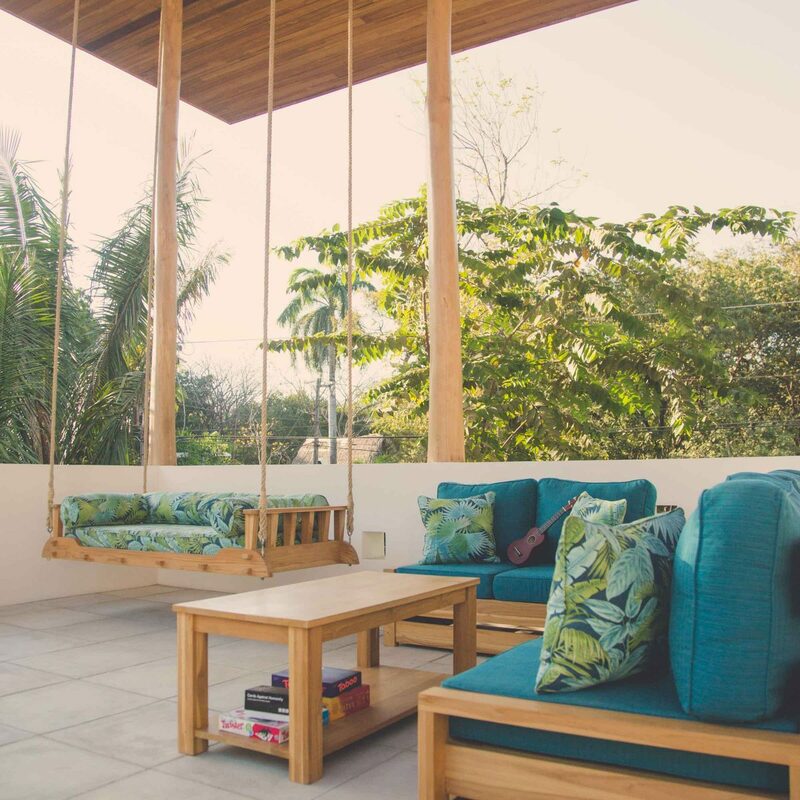 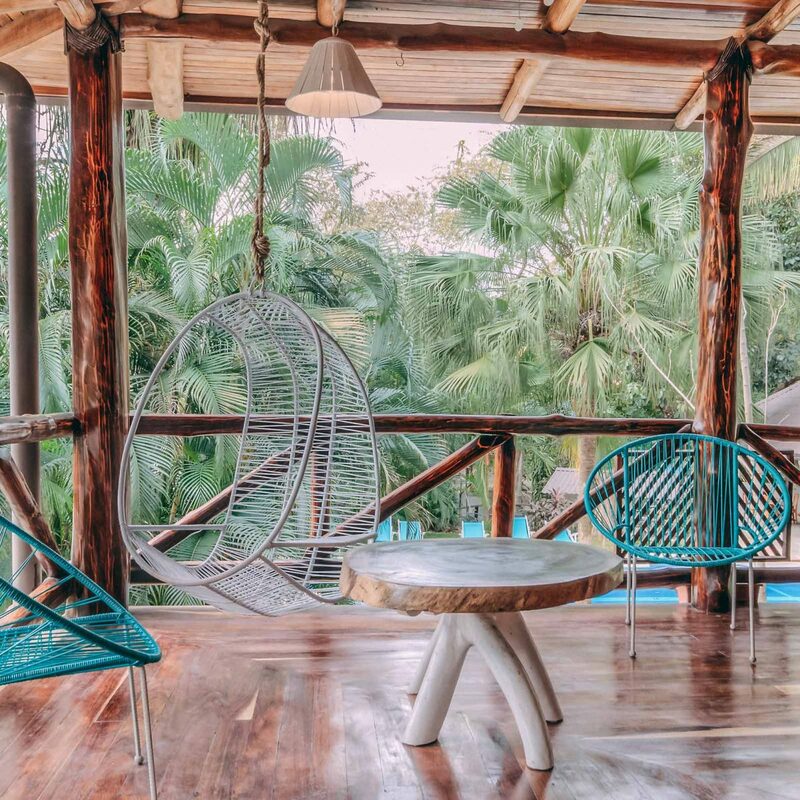 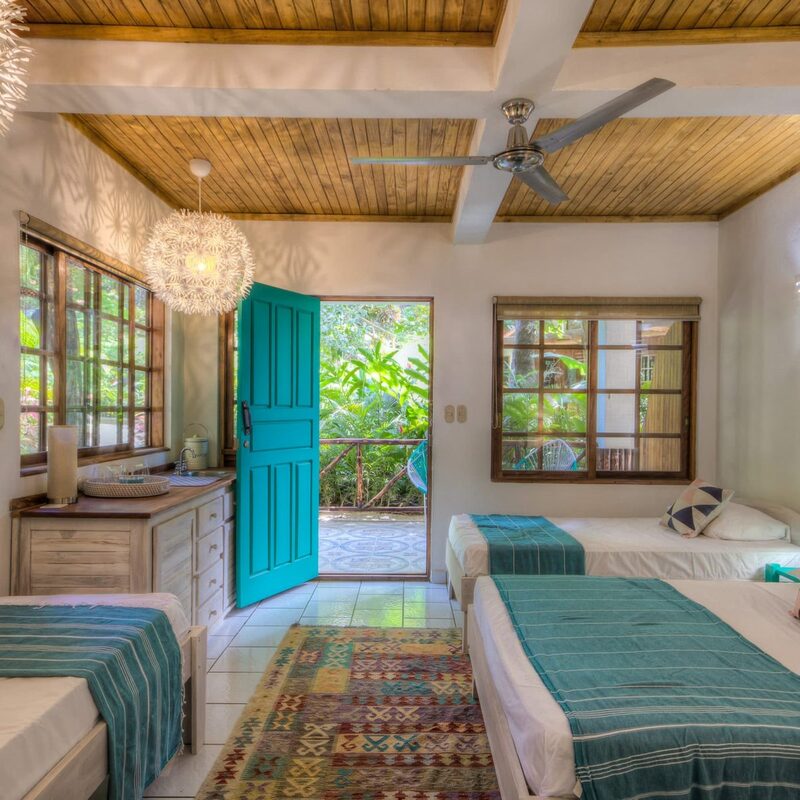 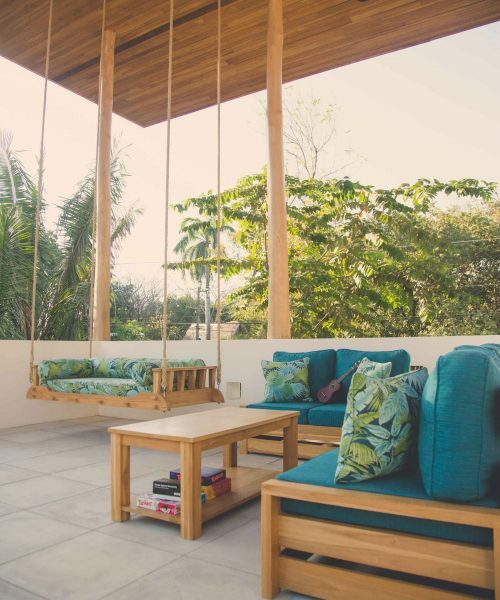 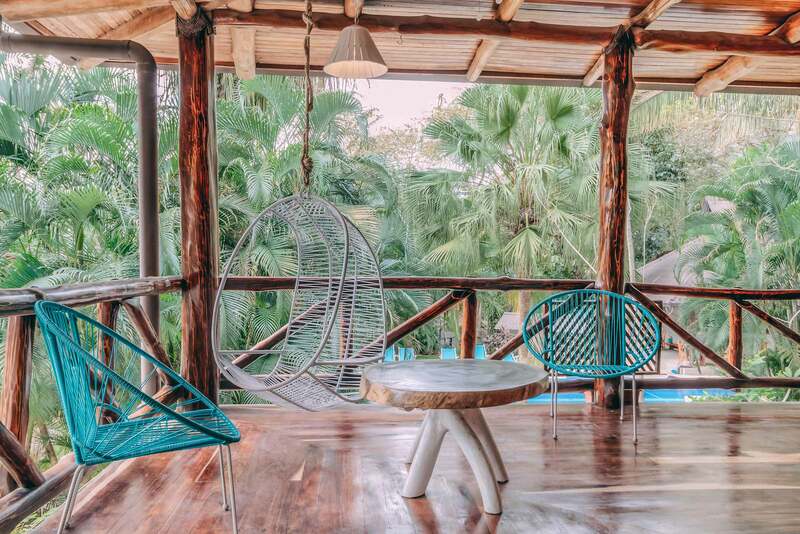 These are the experiences you will remember from your stay at your chic, spacious Costa Rican home. 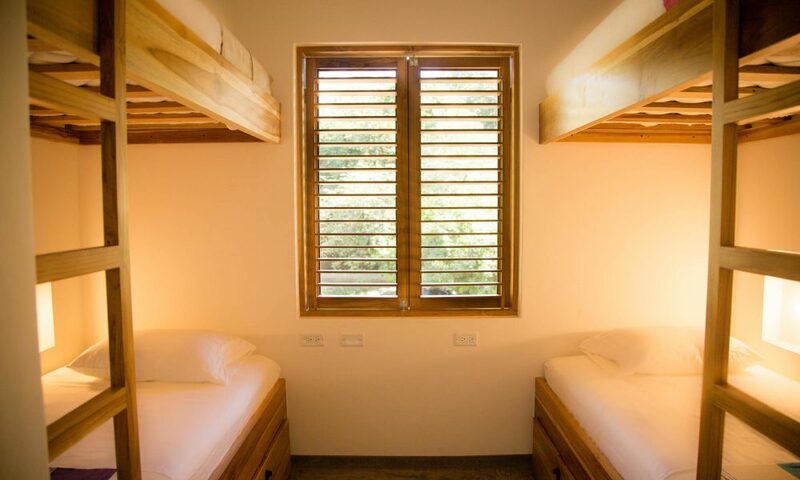 Expect deep sleep comfort, with quality beds, Kate 300-thread-count sheets, blackout blinds and air conditioning. 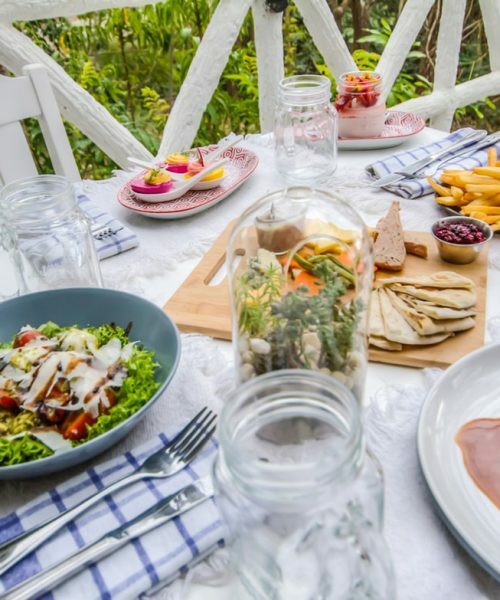 Breakfast is included every morning. 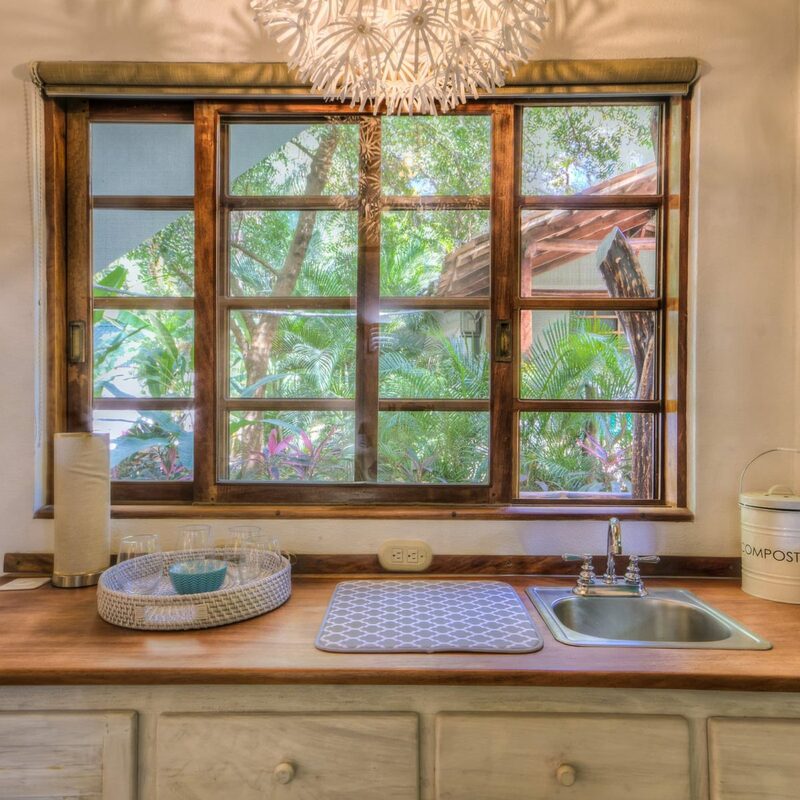 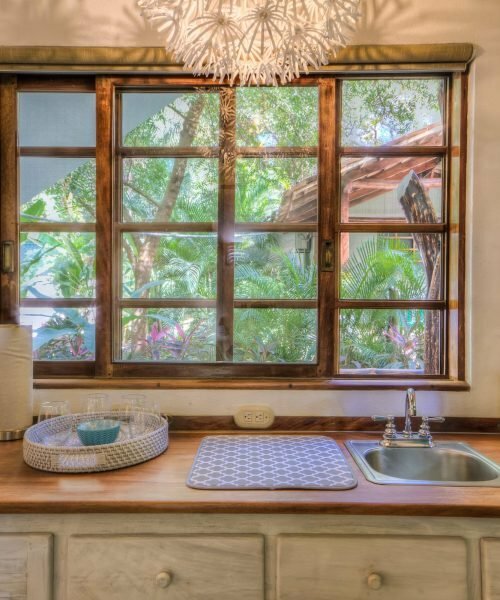 You will have access to fine, farm to table cuisine directly at home. 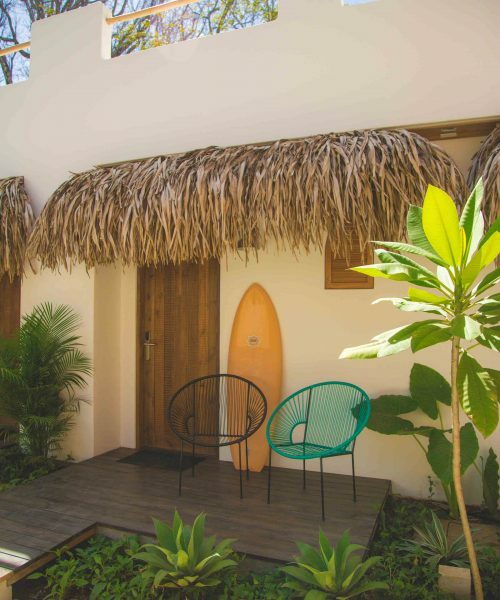 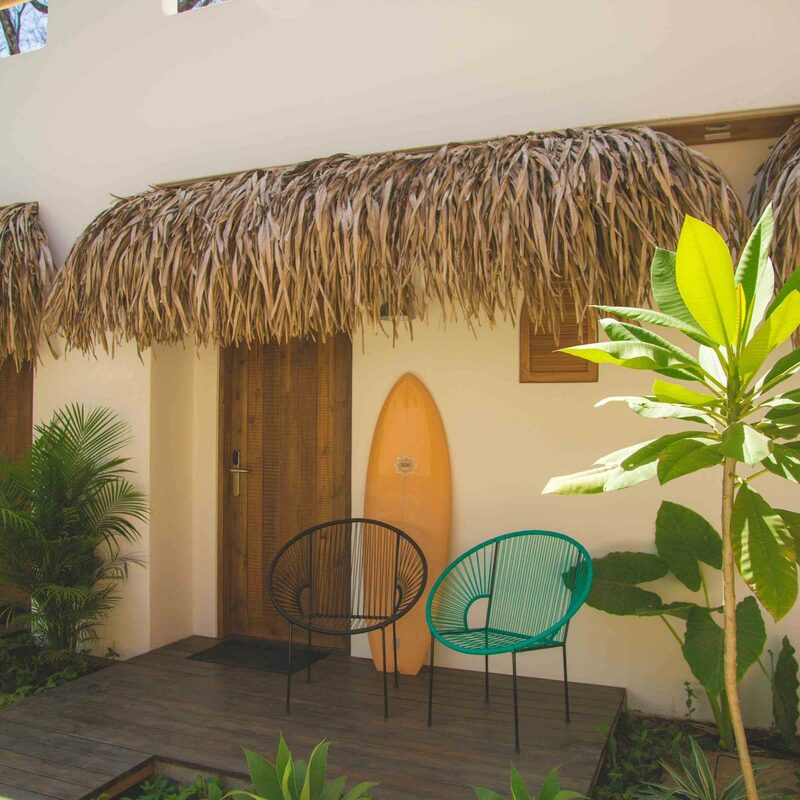 The location of our surf camp is ideal: in a peaceful garden, just a 5-minute walk from the beach, restaurants and cafés. 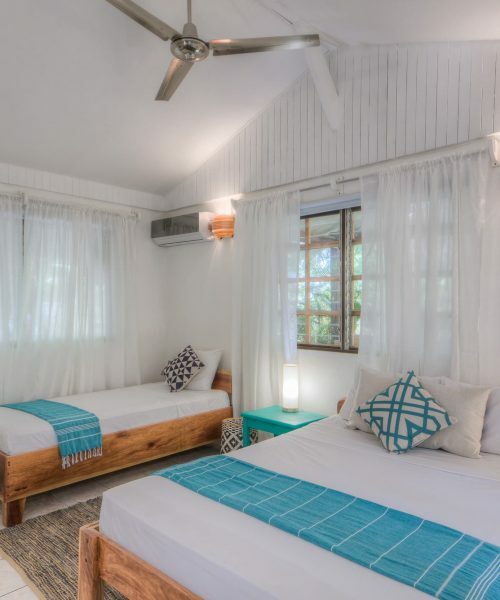 You can also grab free bicycles to explore Nosara. 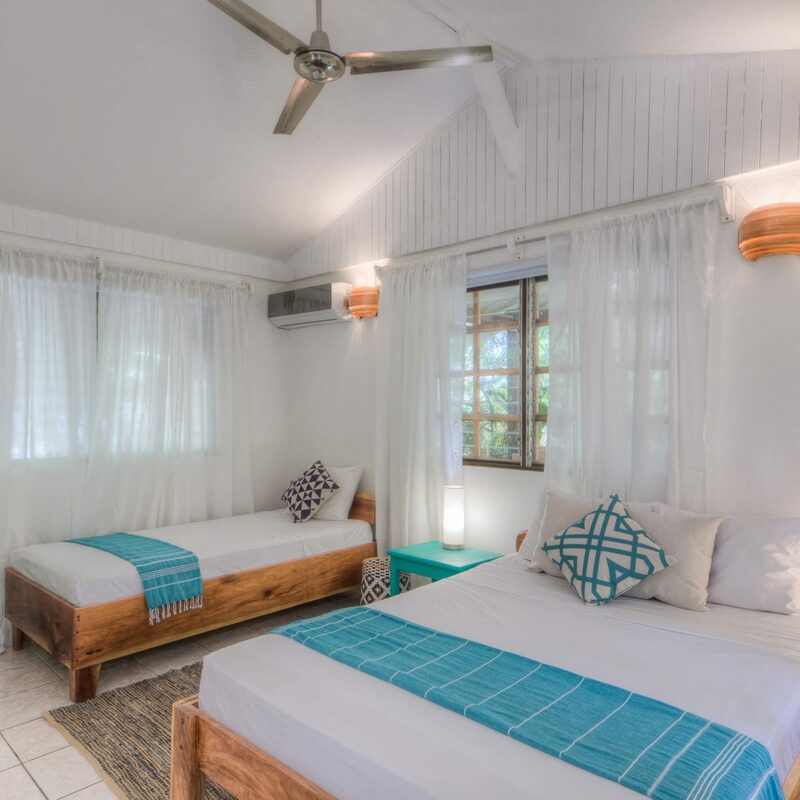 Exclusively for the dates above, our guests will enjoy chic Scandinavian style rooms just a 4-minute walk from the pristine Guiones beach. 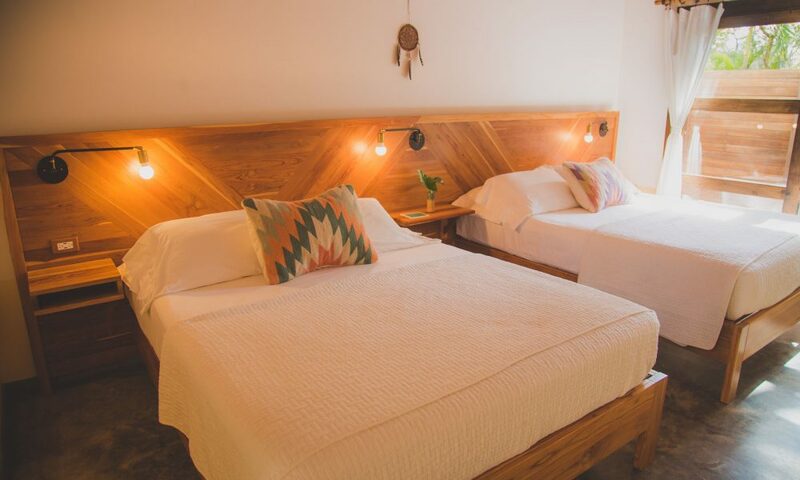 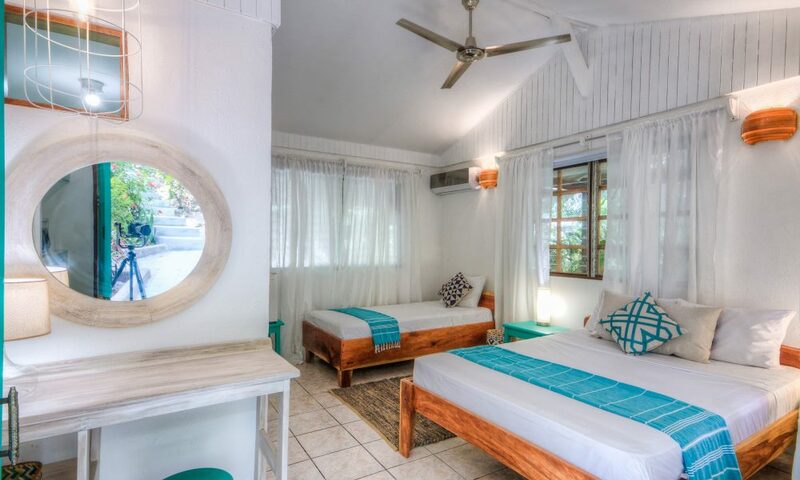 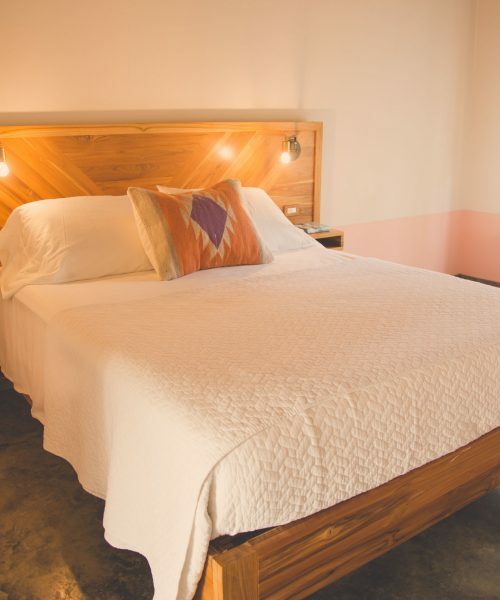 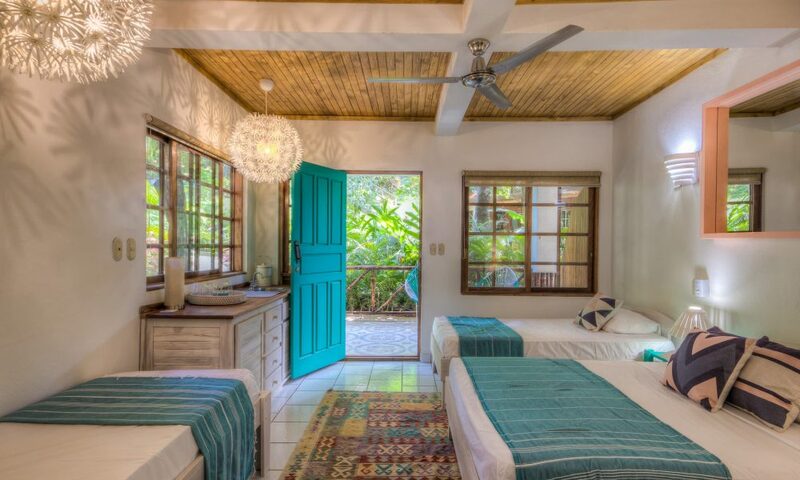 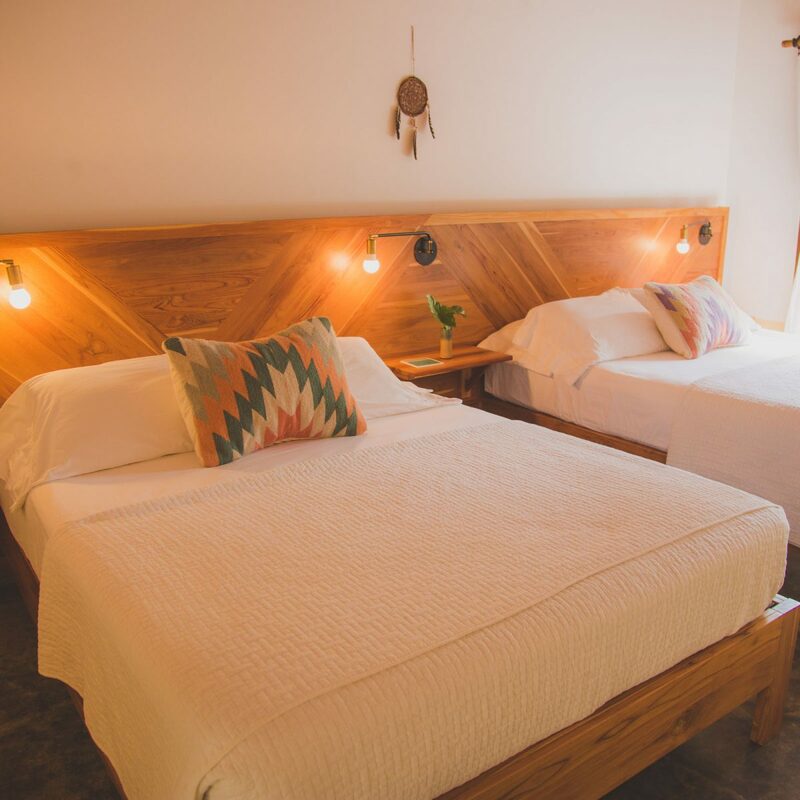 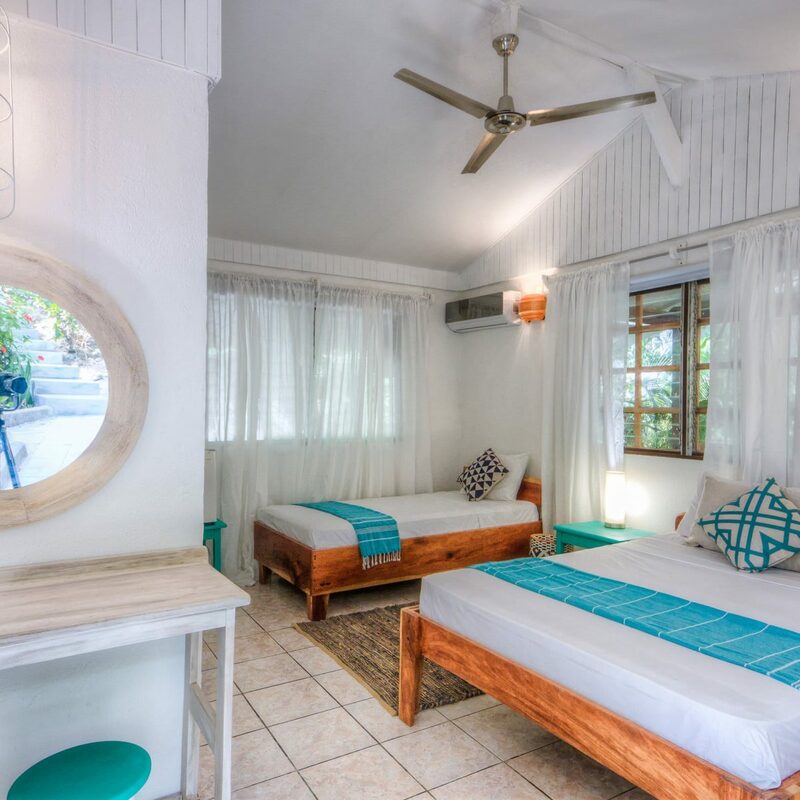 Rooms include locally farmed teak beds, private ensuite bathrooms, a private courtyard, A/C, fan and Wi-Fi. You will be charmed by the elegant bohemian common areas and the magnificent pool. 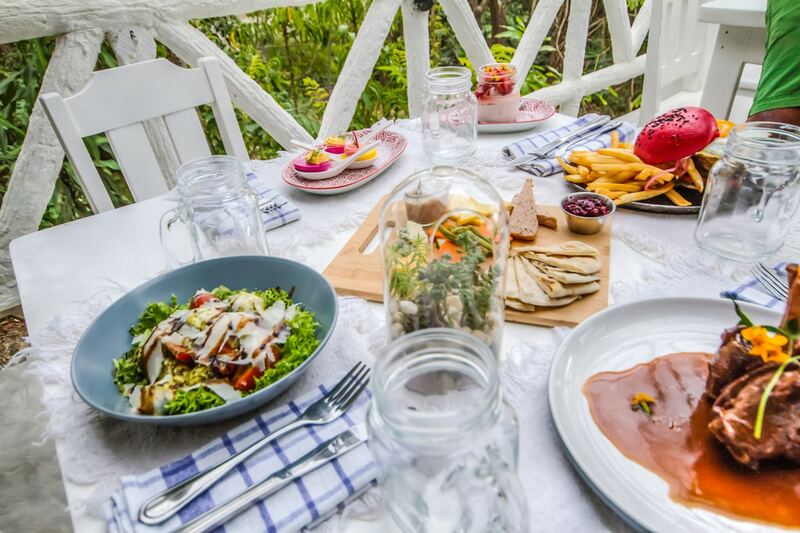 Different healthy breakfast options will be provided and include fresh fruit juice, coffee and tea. 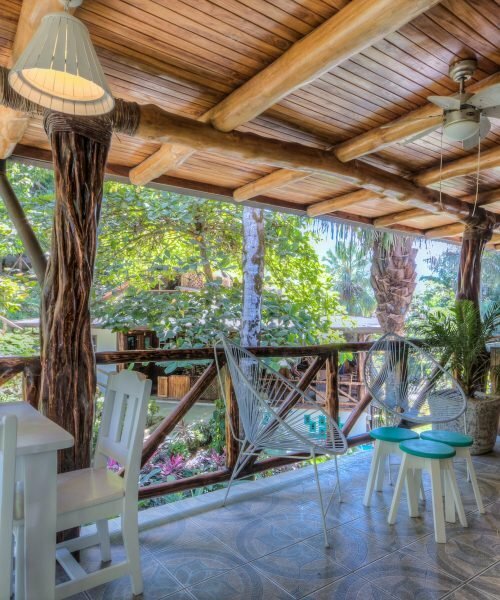 The location is perfect: you can walk and get to restaurants and cafes in less than 5 minutes.